Baking soda, or sodium bicarbonate, has been known for centuries as a versatile substance with many different uses. If you are having a fever or diarrhea, you are losing a lot of your body fluids. Drink enough water or herbal teas to make sure your body stays hydrated and gets plenty of healing sleep while your body is fighting those germs. Hot liquids, such as herbal teas or lemon water, will boost your immune system and many herbs can help your body to get rid of the infection. Avoid caffeinated and fizzy drinks. Garlic is well-known for its flu and cold fighting properties. It works as an antibacterial, antifungal, and antiviral agent. You could make a healing garlic soup or mince 1-2 cloves and add those to a small glass of water. When pregnant limit the intake to 1 clove of garlic day. There are many healing herbs for you to choose from. Herbs that work well to treat the flu or cold are: nettle leaf, peppermint, ginger, yarrow, elderberry, chamomile, red clover, and catnip. Not only adds a great taste to your herbal teas, but has strong antibacterial and antiviral properties. Especially when combined with honey. Works wonders to soothe a sore throat, lower fever, and relieve cough and congestion. Epsom salts help your body to detox, they improve circulation, strengthen your immune system, and reduce inflammation. Elderberries and echinacea are well-known to treat the flu or cold. They strengthen your immune system and help your body to get rid of viruses and bacteria. Effective to treat an upper respiratory or ear infection. Put a few drops of 3% hydrogen peroxide into each ear. Wait for about 5 to 10 minutes, until the bubbling is done, drain on a tissue. Vitamin D helps to speed up the healing process, zinc prevents viruses from reproducing, and vitamin C strengthens your immune system. Lemons are a great source of Vitamin C.
Not the nicest taste but very effective to alkalize your body and get rid of viruses and bacteria. 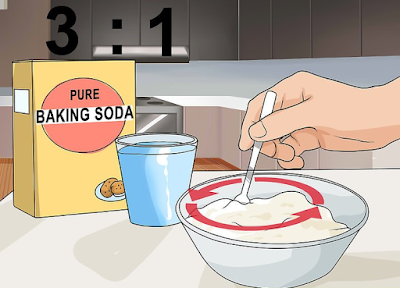 Add one tablespoon to a cup of water, gargle first and drink when the first signs of illness appear. Repeat every hour until symptoms disappear. Add freshly squeezed lemon juice for a better effect. But keep in mind, don’t use this remedy too long as it may cause low potassium levels and may lower bone density when used over a longer period. Herbal steams are a great way to help loosen congestions and kill bacteria and viruses in the lungs, throat, bronchials, and sinuses. You can use essential oils or fresh or dried herbs to make your herbal steam. Thyme, eucalyptus, peppermint, rosemary, oregano or blends of those are all good options for you to try. Boil 1-2 cups of water and add your herbs or essential oils. When using herbs, cover and steep for 5 minutes prior to steaming. Put face directly over pot with towel covering your head to hold in the heat. Slowly breathe the steam in and out for as long as you can, aim for 15 minutes.